Hello, I’m Daliah, creator of Metasymbology and The New Game. 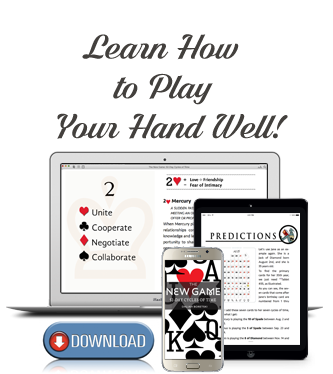 For nearly 30 years I have been using my intuitive, metaphysically driven method of reading playing cards to find success in my own life and that of millions of people world-wide. By illuminating your journey, I can empower you to reach a destiny of your choosing. The New Game will be published in book form for the first time in 2019. For nearly 1,000 years, the origins of Playing Cards remain a mystery to the scholars of antiquity. Centuries have passed and the mystery is still being bought, sold and collected by millions all over the world. Always 52 Cards, always the 4 suits, 2 colors, 12 faces of Nobility and that odd and seemingly useless Joker. One thousand years later, the Cards remain wholly intact. In spite of their indeterminable beginnings and unvarying centuries old design, the 52-Card deck eludes our concept of mystery because no matter what language is spoken, or in which part of the world you live, playing Cards are as familiar as the moon is to the sky. We take them for granted! And we question them not. But what if there is more to the Cards than just mere games of chance? What if their true purpose is to leave nothing to chance? What if their simple and well-preserved design is a language of symbols passed down through the centuries, only preserved and concealed as the world's greatest past time? For those fortunate enough to know how to read the Little Book and its 52 Pages, the mystery is revealed as a map of the stars and a calendar of earth and the world's most popular tool for playing games of chance, is in fact the world's most powerful tool for playing the Game of Life!